For me, primary school is synonymous with a feeling; that sensation of pure unbounded freedom, joy, and limitless possibility evoked by the ringing of the lunchtime bell and the running of six hundred feet in a kind of ritualised race across the oval and towards the Playground. I distinctly remember the sensation of a ball of energy and lightness in my chest, propelling me forwards and upwards towards the whatever newly-adapted version of chasey-on-the-playground that was waiting to happen. The relief and release at finally reaching the untethered-ness of lunchtime, after a day stuck in the classroom, in the confines of our increasingly logical heads. This specific mood and embodied sense of self; what I believe is the very sensation of childhood; is one I like to re-visit sometimes in my head, when I am tired of the “adult” way of being in the world. It used to be unfathomable to me, how anyone could survive a day without the wildness of lunchtime to balance out the logical and ever more constrictive goal-oriented day. It would be like ignoring half of your existence, wouldn’t it? …like covering one eye to the point you even forget it exists. Now, I am not advocating for designated “playtime” for adults in workplaces (although, that would be an interesting idea), but I am advocating for the rights of all children to experience such a sense of potentiality and freedom without constraint, as an intrinsic part of childhood itself. When I moved into year seven and the dress that came with it, lunchtime morphed instantly from a gateway to freedom and creativity into forty-five long minutes of claustrophobic boredom and social anxiety. Sitting awkwardly on the steps outside our building as we made sure not to flash our underwear, I distinctly remember sharing my sadness at the loss of real “play” in my life amongst a group of similarly frustrated girls, as short-wearing boys of all ages played sports on the oval in front of us. It was clear to me then, that the oval “belonged” to the boys. Not just because they were male and therefore more sporty- but because girls did not have the means to use it. It is very difficult to play sport in a dress; more so if you are trying not to flash everyone and get teased. While we did try getting changed into sports uniforms a few times, it took up too much time to be worthwhile and made us late to claim a spot for ourselves where we already felt out-of-place. What is even more frustrating, is that the lack of girls on the oval perpetuated the idea that sport is just ‘not for girls’- and since the oval certainly didn’t feel like it was meant for me, I started to believe it. Subconsciously, I think I still do; it’s a cultural belief I have to actively fight against, like so many other women and girls. The transition from primary school to high school is difficult enough, without taking away girls’ physical freedom too. Already faced with the challenge of making new friends, the task becomes so much harder when you have no idea what “socialising” means if it’s not on a playground. Already suffering under potentially crippling low self-esteem and body image issues, teenage girls do not need a dress to reinforce the notion that their appearance is more important than the capability of their bodies. 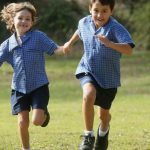 Already struggling with changing bodies and mental health the last thing girls need is for dresses to effectively rule out the possibility of healthy physical activity as a fun and social part of everyday life. And that’s without even mentioning the huge issue of the diversity of sexuality and gender identities, which are totally unrepresented by the dress/short, girl/boy dichotomy. What is most tragic to me, is that girls at some primary schools are not able to experience pure, unhindered play and the sense of freedom and empowerment it brings. Even if I no longer run across the top of the monkey bars playing chasey, I know what it feels like. I know that the way I move in the world now, as an adult, is not simply “natural” or because I’m a “woman”; I know that I have the potential to move differently if I choose. I know that I am entitled to take ownership of space like any male. And I know that I don’t have to move out of men’s way when I’m walking down the street (it’s an interesting thing to try, by the way). It is essential, as far as I am concerned, that every child gets to fully experience childhood, so they at least have the capacity to remember what freedom feels like. Otherwise, how can they pursue it? For themselves or their children? While allowing girls to wear shorts will not solve the entire issue of gender-based inequity instantaneously, we cannot dismiss the impact it will potentially have. School years are when children and adolescents form their identities, sense of self, and assumptions about the world; one small act by a school has the potential to impact who its students become in the future; and by extension, what our society becomes in the future. More than anything else, giving permission for girls to wear shorts or pants is such a simple, easy way to make positive change that it is honestly ridiculous to imagine why anyone wouldn’t.